Emira Montes was a girl living in a remote community called San Francisco, located at the Marañon river, in the Peruvian Amazon. When she was eleven years old, she was taken out of school to help with the chores of her household. This may sound surprising, but it is actually a very normal practice in small communities of the Amazon. The local economies require the men to focus on manual labor, therefore leaving the women and girls to uphold household tasks. This has a direct effect on the education of women and girls. Before Emira was forced to leave school, she would paddle across a river, like all of the other children, to attend the closest school. The laborious act of traveling to and from school by boat each day served as another barrier to education in her community. Despite all of the barriers threatening Emira’s right to education, she still wanted to study. Two years after Emira left school, she and her mother began to listen to a radio program that addressed different topics, including health, education, and gender equity. The program was Minga Peru’s “Bienvenida Salud.” Through this program, Emira heard that Minga Peru also offered empowerment and training workshops for community leaders (promotoras), so at 13 years old, she secretly paddled across the river to attend one of these workshops. In the workshop, Emira stood out for her enthusiasm and interest in learning so Minga Peru offered to help Emira complete her studies. Minga Peru helped Emira attend a high school in the city of Iquitos. 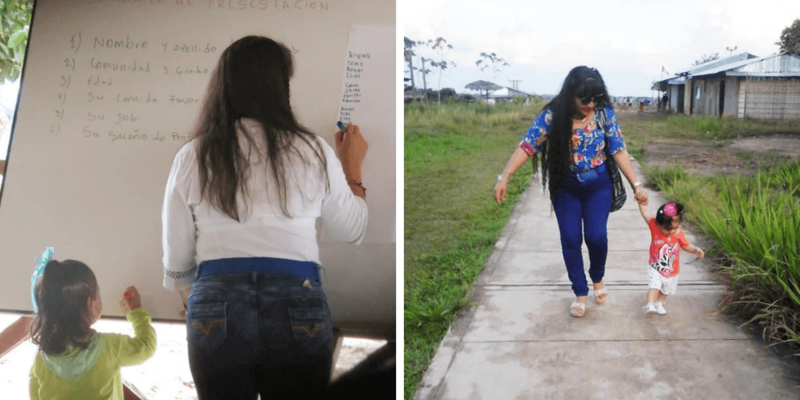 In Iquitos, Emira began participating in the “Bienvenida Salud” program by volunteering in the Minga Peru office and acting as a child voice in the sociodramas on the radio program. “Thanks to Minga I finished high school,” says Emira. With great effort, Emira was granted a Quechua-Latin scholarship, which allowed her to pursue higher education at the University of San Antonio, Texas. There, she studied ecotourism. Currently, Emira wears multiple hats at Minga Peru. She is the host and producer of the radio program, “Bienvenida Salud,” the Regional Coordinator of Iquitos, the Director of Training Young Correspondents in schools, and the organizer of the visits of Lindblad Expeditions-National Geographic to the communities where Minga operates. Emira Montes with her little child in Tambo Minga and in an Amazonian community. For over 20 years, Minga Peru has provided empowerment and training workshops for more than 1,200 women from the Amazon who are now proud community leaders (promotoras) and has produced and broadcast over 1,700 episodes of its radio program “Bienvenida Salud”, reaching over 120,000 radio listeners from the most remote communities of the Peruvian Amazon. Through our workshops and with the support of our radio program, women have found a safe place where they feel heard while developing different skills by having access to key information such as disease prevention, family planning, human rights, and environmental preservation. As a result of these workshops, women, just like Emira, became strong and empowered, which had a significant impact in their communities. These positive changes include a rise in the number of girls attending school, a decrease in domestic violence, a drop in teen pregnancy, as well as HIV-AIDS and STDs. In addition, women now serve in public leadership positions and are able to work and economically provide for their families. 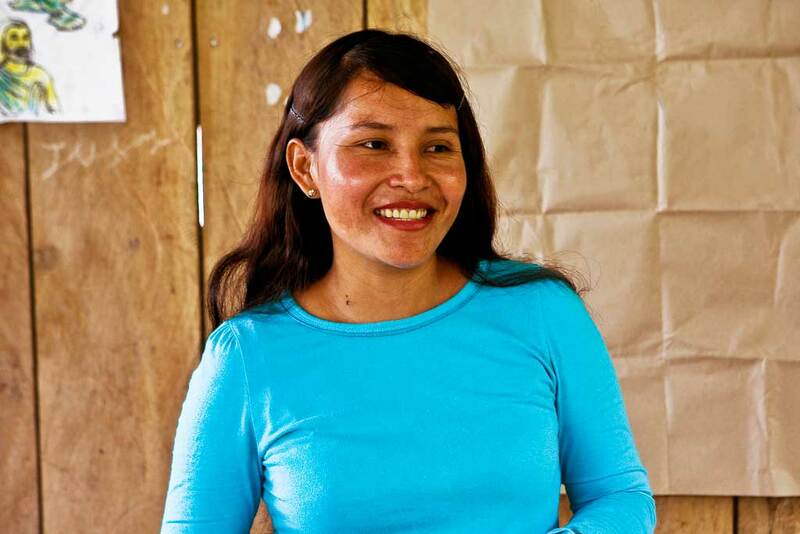 You can also support more women in the Amazon to become empowered and create positive changes in their communities, such as equal access to education, by making a donation to Minga Peru today. ** U.S. donations are tax-deductible and can be made through Minga’s fiscal sponsor, The Resource Foundation.